A shopkeeper wants you to retrieve his family heirloom from a bandit. (Optional) Find Lucan Valerius at the Riverwood Trader and talk to him. Retrieve the golden claw from Bleak Falls Barrow. Find the secret of Bleak Falls Barrow. Return the claw to Lucan. Note: The events of this quest are closely related to those in the quest Bleak Falls Barrow, at times taking over important objectives. It can be triggered right after entering Riverwood, but it is recommended to follow the intended path and initiate the Bleak Falls Barrow quest in Whiterun. Otherwise, you may miss a few story-related events and details. See this section for details. In Riverwood, you may hear concerned townsfolk talk about a recent robbery at Riverwood Trader. When you pay a visit to the store you will find proprietor Lucan Valerius and his sister Camilla in the middle of a hefty argument, both of them frustrated with recent events. Talking to Camilla will not help much, while Lucan will be more informative, although puzzled: "Yes, we did have a bit of a... break-in. But we still have plenty to sell. Robbers were only after one thing. An ornament, solid gold. In the shape of a dragon's claw." If you offer to help him get the claw back, he will offer a gold reward and will then continue debating with Camilla. She will argue that you may need a pointer in the right direction and will then get up and leave. Follow her outside and she will point out Bleak Falls Barrow, barely visible in the distance behind Alvor and Sigrid's House, and lead you to the bridge northeast of town. She will provide some sparse directions, but follow her advice and pick the northwestern trail up the mountain. At this point, make sure you have the concurrent quest in your journal. If not, you can go to Whiterun and activate it. If you don't want to go through the introduction at Riverwood Trader, go straight to Bleak Falls Barrow and you will receive the quest when you overhear two bandits in the first room. "Cut me down before that thing gets us!" 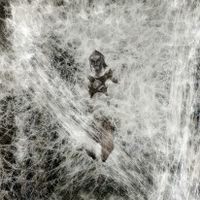 When you find the thief, Arvel the Swift, he will be trapped in a spider web by a Wounded Frostbite Spider. Kill the spider and talk to Arvel. Arvel claims that he will give you the claw if you free him from the web. Once you free him, Arvel will flee, forcing you to pursue him deeper into the dungeon. Alternatively, if the spider is too strong for you, you can just free him from the web and pursue the fleeing Arvel; the spider is too big to leave the room. If you overtake Arvel quickly, you can kill him yourself; otherwise, he will soon run into a group of draugr, who will likely eliminate him easily. If you protect him from the draugr, he may be killed by the spike trap up ahead. You can loot the claw and a journal from Arvel's body. The journal hints that the claw is actually a key of some sort. Although you have found the golden claw, you cannot return it to Lucan until you find the secret of Bleak Falls Barrow, so continue through the chambers. After a while you will find yourself in what appears to be a burial tomb and you will have to fight your way through a group of draugr. If you have not killed Arvel by the time he reaches this room, the draugr will likely kill him. Continue on until you find a puzzle door with three animal seals on it. The claw is the key, however it will not open the door like a regular key would. 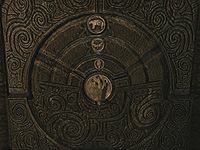 Instead, examine the claw in your inventory and you will see several symbols engraved in it, palm side up. Set the seals in the correct order: Bear—Moth—Owl, and open the door. When you enter the door, follow the tunnel until you find yourself in a large, open room. You will see a Word Wall. When you approach it, one word will stand out, and your character will learn a Word of Power. A level-dependent creature (at low levels a Draugr Overlord and at higher levels a Dragon Priest) will then rise out of a coffin and you will have to kill it. Leave the dungeon and return to the village. To leave the dungeon, climb to the top of the stairs and activate the lever on the pedestal. There are three chests in this room where you obtain the Word of Power; one centered by the sleeping draugr is quite well seen and unlocked. The second is behind the waterfall on the left. The third has a novice lock and is located to your right behind the waterfall. To find it, go across the bridge but not up the steps leading to the wall, go right along the river path to the bigger waterfall, you will have to jump around on the large stones to the right of the waterfall to gain access to the chest. You will see the chest nesting among the rocks behind the waterfall when in third person view. If you return the Golden Claw, Lucan or Camilla will give you a leveled amount of gold, increase their disposition toward you to "friend" (assuming you previously were not), and return the item to its home on the counter. This quest counts towards the Sideways achievement regardless of whether you do the quest for Lucan or Camilla (i.e., both quest stages 100 and 110 qualify). You cannot return the claw to Lucan until this part of the concurrent quest is complete. While guiding you to the bridge, Camilla frequently gets stuck in place. Walking a few steps exactly behind her in line with the road prevents this, and if already stopped, returning yourself to that exact position will usually make her start walking again. If all fails, just go on and leave her; she will return to Lucan and her directions are not needed for the quest. If Camilla is somehow killed Lucan will exclaim how he wishes Camilla was here to see this. If you kill Arvel before he turns against you, then you cannot check your next objective. However, this can be fixed by reading his journal and skipping to the last step of returning it to Lucan once the dungeon is finished. Arvel can be thrown into the wall when he steps on the pressure plate that activates the swing spike trap. Unfortunately, it is unlikely you will be able to reach his body in order to search him for the claw and journal if this happens. ? If you cast Fury on the Wounded Frostbite Spider, Arvel will somehow run over and begin to fight it. After it dies or Fury wears off, he will stand where he is and engage in the normal dialogue with you. You still have to go cut the webs, and after you do, he will begin his sprint down the hall like normal. ? 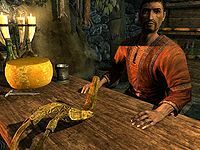 If you don't speak to Lucan before going into Bleak Falls Barrow, you may trigger a bug which will prevent you from completing the quest if you attempt to give him the claw after you have obtained it in the dungeon during your quest for the Dragonstone. You can fix this by loading a save from before the beginning of the quest. 100 Finishes quest I have returned the Golden Claw to Lucan, who rewarded me for my effort. 110 Finishes quest I have returned the Golden Claw to Camilla, who rewarded me for my effort. 200 Fails quest Camilla and Lucan Valerius are dead. Any chance of getting a reward from them for retrieving the golden claw died with them. The following empty quest stages were omitted from the table: 5, 6, 7, 8, 13, 20, 30, 50, 250. On the PC, it is possible to use the console to advance through the quest by entering setstage MS13 stage, where stage is the number of the stage you wish to complete. It is not possible to un-complete (i.e. go back) quest stages, but it is possible to clear all stages of the quest using resetquest MS13.